A lot of people want to get into shape, and yet a lot of people don’t know where to start. There are so many programs out there, it can be confusing as to which works. That’s not even getting into the question of whether your goals are aesthetic-based or performance-oriented. There’s an answer for nailing down that base level of fitness though, and it’s given to us by none other than the U.S. Military. 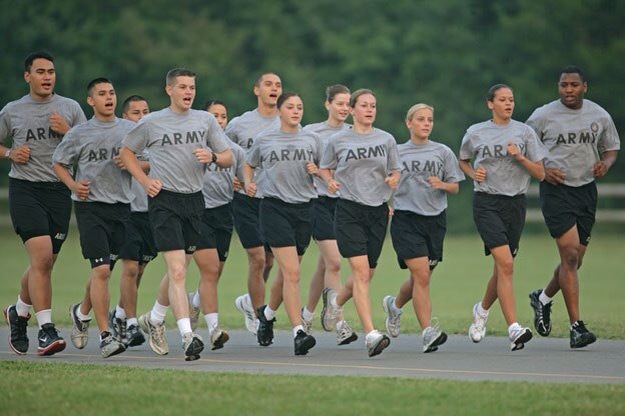 Both the Navy and Air Force have a paltry 1.5 mile run as their cardiovascular component, which actually makes sense, since sailors and airmen aren’t typically on the front lines (although there are always exceptions). The Army has it slightly more intense with two miles, and the USMC caps it off at three miles. The branches alternate between crunches and sit-ups for their measurements in this area, but on the other hand it’s the the area where the sexes are most equal. Only the Air Force has different standards. So once again, the Marines set themselves apart. Instead of the standard push-ups, they go for the considerably more difficult pull-ups. Due to the difficulty for women to perform pull-ups, they can opt for a flexed-arm hang. The Navy (for obvious reasons) also has a swim component. These charts aren’t great because “Oo-rah” or “,” but because they’re good, basic fitness guidelines. Does every member of the military meet the highest of these standards or even look like they’re super fit? No. If you hit all the highest marks, are you going to become a supersoldier? No. But a little over 24 minutes is a respectable 5k time, and 20 push-ups isn’t winning you a strongwoman contest, but it will give you some arm definition if you’re coming from a heavy cardio background. Even if you’re already training with a regimen, adding these can supplement the exercises you’re already doing. You have an enormous range of fitness within these standards, from a basic level to a well-rounded beast. If you’re keeping score, below are the two extremes you can find with these standards. Just for fun, I also included the absolute minimum and maximum, although if you hit these all of these, it wouldn’t actually qualify you for any branch of service.